This week, I would like to honor the life of my sister, Marsha Swinehart, RN, on her birthday, April 10. I also want to share some of the lessons God has been teaching me in the school of sorrow these past eight months. I don’t think I ever would have become a nurse without her influence. She led me to the Lord Jesus Christ when I was 15 years old (See Life Changing Letter) and was my first Bible teacher. My birthday is April 9, so we always celebrated our birthdays together as we grew up. 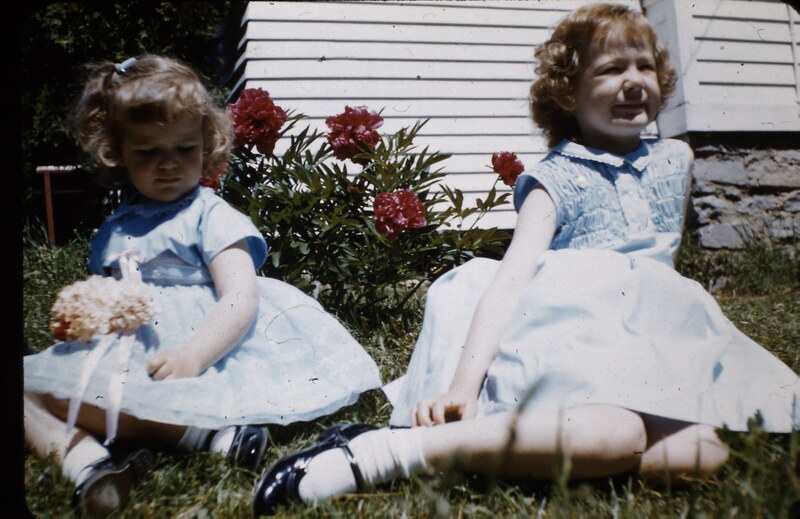 Mom often dressed us in matching outfits, so I thought that made us twins. Marsha was my best friend on earth and I still miss her so much, especially hearing her voice on the phone. But I wouldn’t wish her back to this old world, because I know she is gloriously happy in heaven worshiping and serving our dear Savior, the Lord Jesus Christ. Someday, in God’s perfect timing, we will be reunited in heaven above at the throne of our dear Savior. Pam and Marsha celebrating their birthdays together. Marsha went home to heaven to be with Jesus Christ on August 12, 2015, after a year-long battle with ovarian cancer. I thank God that I could be with her in the hospice unit during the last few days of her life here on earth. She not only taught me how to live in Christ, but how to die in Christ. Her life verse was “For to me to live is Christ, and to die is gain (Philippians 1:21 KJV). 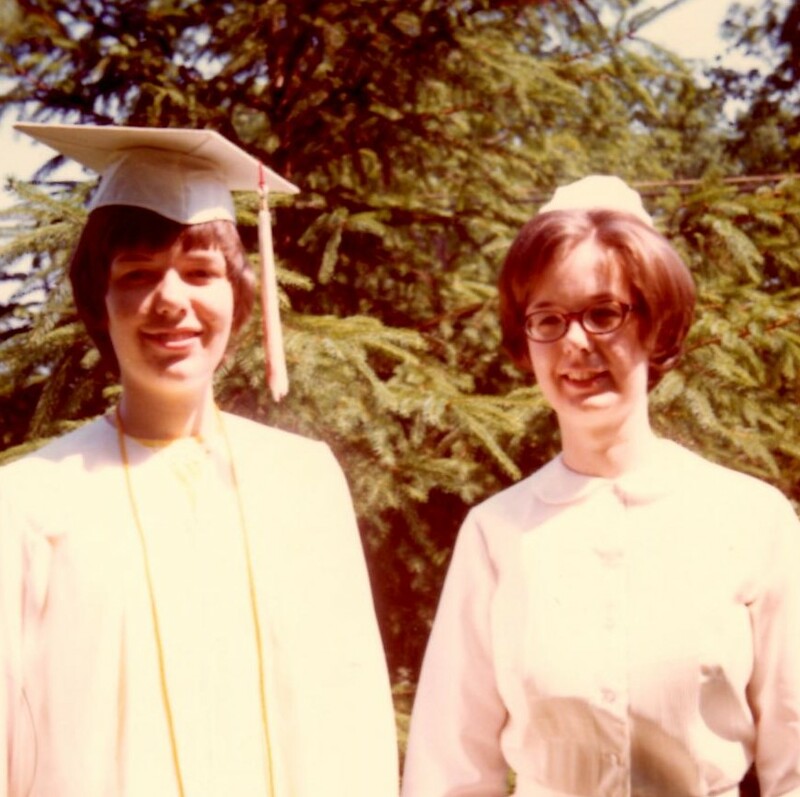 Pam graduated from high school and her sister, Marsha, RN graduated from nursing school the same day. She left a rich legacy of numerous spiritual children from her 25 years as a Bible Club teacher, 30 years as a public health nurse, and the last ten years of her career teaching public health nursing at two different universities. Early in her career, she was a missionary nurse in the jungles of Suriname, South America. As a college nursing professor, she led student nurses on short-term mission trips to New York City, Swaziland, and the Dominican Republic. She had us sing the beautiful hymn “Face to Face” at her memorial service. Face to face with my Redeemer, Jesus Christ who loves me so. On Easter Sunday (March 27) this year, I was really missing Marsha. But God encouraged me when I read the following thoughts on sorrow from a devotional book by Miles J. Stanford called None But the Hungry Heart. “Nevertheless, God, that comforteth those that are cast down, comforted us” (2 Corinthians 7:6 KJV). All of us are going to have sorrow, and none of us should miss its spiritual benefits. God’s purpose is to conform us to the image of the Lord Jesus. God had one Son, without sin, but not without sorrow. Sorrow reveals unknown depths in the soul, and unknown capabilities of experience and service. God never uses anybody to a large degree, until after He breaks that one. It takes sorrow to widen the soul. We cannot do good to others save at a cost to ourselves, and our afflictions are the price we pay for our ability to sympathize. He who would be a helper must first be a sufferer. We cannot have the highest happiness of life in succoring others without tasting the cup which our Lord Jesus drank. The school of suffering graduates rare scholars. It is but a little while and He will appear to answer all inquiries and to wipe away all tears. I would not wish, then, to be of those who had none to wipe away, would you? Some of Marsha’s favorite verses were “And I heard a great voice out of heaven saying, Behold, the tabernacle of God is with men, and He will dwell with them, and they shall be His people, and God Himself shall be with them, and be their God. And God shall wipe away all tears from their eyes; and there shall be no more death, neither sorrow, nor crying, neither shall there be any more pain; for the former things are passed away” (Revelation 21:3-4 KJV). Pam, thank you much for your post today in remembrance of Marsha. I can never miss her as much as you do, but I do miss her in many ways. She and Keith were so good to Bob and I.